Simply stunning Lake Como accommodation! Situated on the gorgeous and unspoilt western shoreline of Lake Como this fabulous retreat is ideal for travelling couples or little groups of 4 people, offering a wealth of rustic charm, scenery and every comfort for a relaxing and ever-memorable self-catering stay. 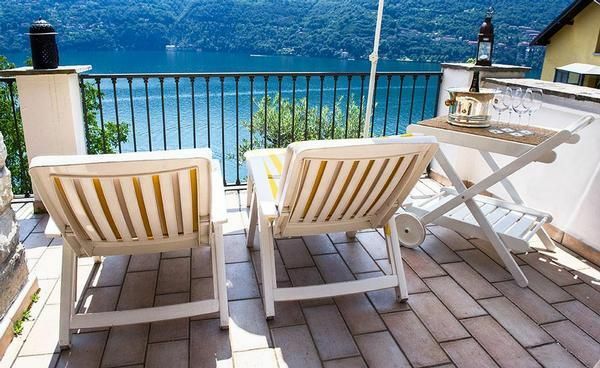 The beautiful property boasts accommodation over two floors and comprises a spacious living area from which you can have a wonderful, stunning view on the Como lake. A modern living and dining area and a fully fitted kitchen providing all the desired appliances are ideally placed for dinners, parties and more informal meals. The accommodation further comprises a double rooom situated to the first floor furnished with pretty tones. A balcony and two terraces with barbecue are present to have breathtaking views towards the picturesque lake shoreline and comfortable dinners. The property further provides guests with two renovated bathrooms. Final cleaning: per object and day Costs amounting to 15 EUR (Mandatory). Cot (once per object, Costs amounting to 100 EUR). Parking facilities (per property and day, included in price 0 EUR).